This week we have the amazing writer/director Vicky Jewson (Lady Godiva, Born of War) on the program. Her new film, Close, stars Noomi Rapace as a counter-terrorism expert and bodyguard tasked to protect a wealthy heiress. It's a gritty, intimate action film, and that's why the movie Vicky has chosen to discuss is so apt. This week Vicky will be discussing 2002's, The Bourne Identity. Vicky elaborates on the influence this film had on her, and how the Bourne series has had a huge influence on the current iterations of the Bond movies. Vicky goes in depth on mapping out action sequences and working with stunt coordinators to achieve a spontaneous feel in her film. She also talks about working with Noomi Rapace, and why it was difficult for her to call "cut." Vicky and April also go behind the scenes of The Bourne Identity and outline Doug Liman's career trajectory from indie films to directing an unorthodox blockbuster action film. You can see Close on Netflix. If you haven't seen it yet, go watch The Bourne Identity. With April Wolfe and Vicky Jewson. This week we've got writer and director Shaz Bennett on the program to talk about Kathryn Bigelow's classic, Point Break. As Shaz says on the show, this is the movie she most wishes she had directed. She and April also discuss Shaz's newest film, Alaska Is a Drag, which follows an aspiring drag queen turned boxer stuck working at a cannery in Alaska. The two of them dissect the masterful directing of Bigelow during the visceral chase scenes. They look at the unconventional casting of Patrick Swayze and Keanu Reeves. They praise the performance and genius of Lori Petty. And Shaz elaborates on being yourself while directing, and being close to your actors on set. April has a special connection with this film as well, having written a retrospective for Rolling Stone last year. 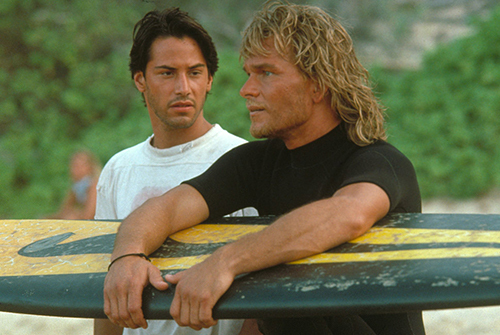 If you haven't seen it yet, go watch Point Break. With April Wolfe with Shaz Bennett. This week we are so lucky to have on director, actress, and dancer, Delila Vallot. Delila is a prolific worker and has too many credits to list. But some of her films as director include the thriller Tunnel Vision and the documentary Can You Dig This? which won a Jury Award at the Los Angeles Film Festival. On this episode she is here to discuss Black Panther. She and April talk about Michael B. Jordan's acting techniques and the effects of going method for a role. They touch upon how director Ryan Coogler was able to take a huge property like Black Panther and still make it personal. And they cover the intentional use of the actor's natural hair in the film and the importance of representing it in media. If you haven't seen it yet, go watch Black Panther. With April Wolfe with Delila Vallot. On this very special episode, the ladies of Lady to Lady (Tess Barker, Barbara Gray, and [past guest panelist] Brandie Posey) are taking over hosting duties in honor of The Great Switcheroo! I bet you never thought you'd hear so much Magic Mike XXL chat on a Wham Bam Pow, huh? Plus, we give you a review of the 1984 action/romance flick Romancing the Stone! You can catch Rhea and Ricky on Throwing Shade this week, and hear Tess, Barbara, and Brandie on Lady to Lady every week (save this one). We'll be back in late October with a new Wham Bam Pow for your ears! Follow us on Twitter! Cameron is @cameronesposito, Rhea is @rheabutcher and Ricky is @rickycarmona. Discuss the show using the hashtag #WhamBamPow! This week: Ricky Explains Movie Trailers to Rhea, what marvel over Fantastic Four, and we delve into Mission: Impossible - Rogue Nation. Plus, baseball talk! We'll be back next week with a review of Starship Troopers, which is available now on Netflix Watch Instant! Happy birthday, Arnold Schwarzenegger! In honor of the birth of the original Terminator himself, we dug into the newest entry in the franchise: Terminator Genisys. Love you, Arnold! Plus, Rhea and Ricky are joined by a very special guest -- Rhea's mom! Tha' Mom shares the movie that made her, and Ricky drops some hot summer trailers on us. BAM! We'll be back next week with a review of Mission: Impossible - Rogue Nation, which is in theaters now! This week, comedian Baron Vaughn and MaxFun impresario Jesse Thorn join Rhea Butcher to swap Comic Con news and anecdotes. Plus, a review of Thief! You can follow Jesse on Twitter @jessethorn, and you can hear him on Bullseye and Jordan, Jesse, Go. Baron's on Twitter @barvonblaq, and you can see him on Grace and Frankie on Netflix and hear his movie podcast Maltin on Movies on Wolfpop. We're off next week, but we'll be back on July 30th with a review of Terminator Genisys, which is in theaters now!